Perfect for balancing Kapha — the often dominant Dosha during deep winter and into spring (and also for Pitta as the summer eventually comes round!) — an easy, and unusual green banana stew. I picked this up in Zanzibar, where the recipe really shows off the varied cultural influences over this part of Africa. Green bananas are basically very unripe dessert bananas, something that I wouldn’t normally touch with a barge pole! Totally indigestible. But just like many ingredients we know and love, once simmered until tender they becomes nutritious foods. 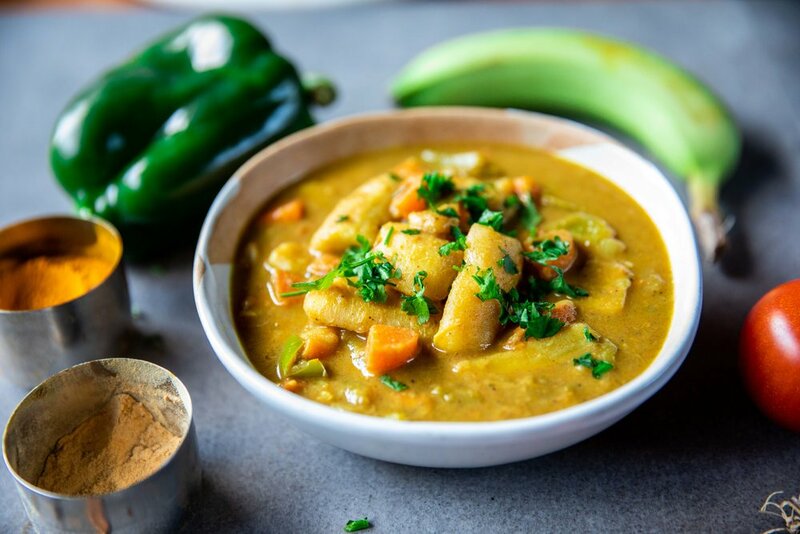 With the addition of spices and aromatics, the green bananas become soft and yummy, and the dish is reminiscent of a perfectly cooked potato stew. Plantains, basically giant unripe bananas, are similar in nature to green bananas. If you fancy trying this dish with plantain then you’ll need to increase the cooking time as they are not only bigger, but a lot harder. Enjoy this simple and comforting stew with freshly steamed basmati rice and some chutney (try this cooked one or this fresh one) for an exotic, easy to digest weeknight supper. If you’re enjoying in the summer, heap on plenty of fresh coriander to make this an extra Pitta-balancing dish. Slice the bananas/plantains lengthways. Peel and cut into 1.5 - 2-inch pieces. After a few minutes add the chopped tomato, garlic, chopped banana, and the two cups of water, and season with the salt and pepper. Allow to simmer, lid on, for about 30 - 40 minutes or until the banana is tender (it can be up to an hour for the plantain). Stir through a handful of chopped coriander (optional). East by West tip: If you have a Kapha imbalance or are feeling cold and lethargic, leave out the coconut milk and use vegetable broth, chicken bone broth or water, and up the spices. The stew is also delicious with added leafy greens.